John Kelly: Income Per Capita and Teacher Pay. Income Per Capita and Teacher Pay. 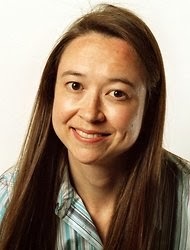 The New York Times has an article up today by Motoko Rich, which is second in their "most emailed" list. It concerns a newer study by Anne Fernald, a psychologist at Stanford University. Earlier research on language development found that by age 3, the children of wealthier professionals have heard words millions more times than those of less educated parents, giving them a distinct advantage in school and suggesting the need for increased investment in prekindergarten programs. Fernald's follow-up study has found a language gap as early as 18 months. I wanted to look at the study itself; Wiley published the journal in question, and after paying a fee (grr...) I took a look at the PDF. The sample sizes Fernald uses are small, and somewhat oddly, she was vague about the two locations the study's based upon. From the article, it's clear that the first site she tested was at or near Stanford University; the second location is "a few hours north." The study itself gives a few more clues in the table below. 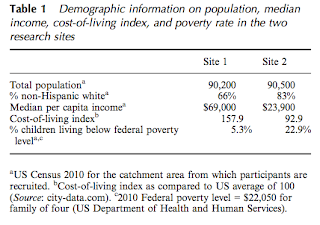 The total population numbers, percent non-Hispanic white, and cost-of-living index are a demographic fingerprint of where this study was conducted. 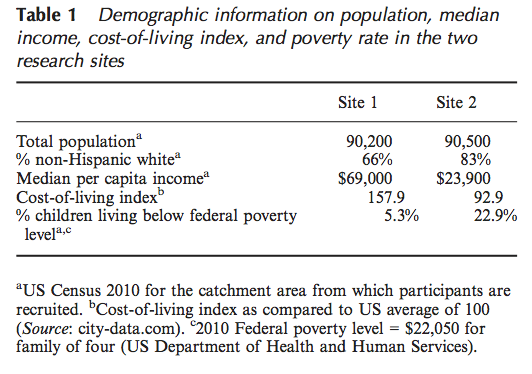 Those numbers match up very well indeed with Redding, California, in Shasta County -- the white population there, according to city-data.com, is 82.2% (Fernald reports it as 83%), the population is 90,755 (she reports it as 90,500) and per capita income is $21,585. Dr. Fernald's evasiveness is probably explainable by her relationship with the Shasta County Office of Education (see this and this). I mean, I get it, it's not like anyone in Shasta County is going to be particularly happy being described in the New York Times as California's version of the poor whites of rural Appalachia. And of course, Shasta County really isn't like that at all; the article in the New York Times slipped on the difference between median income and median per capita income. The median income in both locations is roughly double what the New York Times reported. I suspect the mistake comes from the fact that Motoko Rich from the Times just couldn't believe that a family is "low income" in California when their income is over $40,000 (the idea that median income in Palo Alto is $69,000 should have been a big warning sign). However, this is a fact that many here know all too well -- the cutoff for affordable housing in Sonoma Valley, for example, has often been a family income of approximately ~$90,000 a year, which simply astounds the rest of the United States. "Language-Gap Study Bolsters a Push for Pre-K"
The New York Times, October 22, 2013, p. 2. "Literacy experts have previously documented a connection between a child’s early vocabulary and later success in reading comprehension. In a study tracking children from age 3 through middle school, David Dickinson, now a professor of education at Vanderbilt University, and Catherine Snow, an education professor at Harvard University, found that a child’s score on a vocabulary test in kindergarten could predict reading comprehension scores in later grades." "Mr. Dickinson said he feared that some preschool teachers or parents might extract the message about the importance of vocabulary and pervert it. 'The worst thing that could come out of all this interest in vocabulary,' he said, 'is flash cards with pictures making kids memorize a thousand words.'" "Instead, literacy experts emphasize the importance of natural conversations with children, asking questions while reading books, and helping children identify words during playtime." "Even these simple principles may be hard to implement, some educators say, because preschool instructors are often paid far less than public schoolteachers and receive scant training. In one study, Robert Pianta, dean of the Curry School of Education at the University of Virginia, found that in observations of 700 preschool classrooms across 11 states, teachers in less than 15 percent of the classes demonstrated 'effective teacher-student interactions.'" That's right. We're treating the people who interact with our kids like crap, and we're getting what we've paid for. And the consequences are severe over time. Indeed. I agree that our preschool teachers should be better trained and paid more. They play a vital role in creating the educational foundation for our children. Thanks for sharing, John. Thanks Jen -- Motoko's actually pretty cool, she emailed back like right away, the Times is fixing the per capita issue online.